Hitting the beauty scene by storm, multimasking is the top mask trend of the moment! Applying different masks to particular skin zones helps to target skin problems such as, blemishes and enlarged pores all at once. Pick and mix your skincare with 7th Heaven for your personal skincare routine. You could even step up your beauty ritual with our 7th Heaven Strengthen Nail & Cuticle Finger Masques (coming soon to select Walmart stores!) to moisturize your cuticles, while the masks get to work! 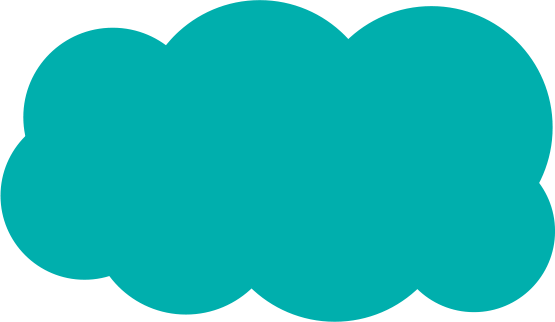 Continue reading for all the know how on multimasking. Pick and mix your skincare with 7th Heaven for your personal skincare routine. Strawberry Souffle hydrating mud mask, Exfoliator & Masque 2 in 1, SPA Range Strengthen Nail & Cuticle Finger Masques. Suffer from oily congested pores and prone to blemishes within your T-Zone area? We recommend applying a deep-cleansing mud such as 7th Heaven Dead Sea Mud Pac or treat pores to a total detox with our exfoliating 7th Heaven Charcoal Masque. If a mud isn’t for you, try a peel off mask – our 7th Heaven Dead Sea Peel Off helps to absorb excess oils, remove dead skin cells and purify pores. treat pores to a total detox with our exfoliating 7th Heaven Charcoal Masque. 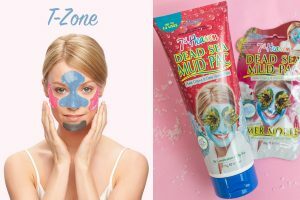 7th Heaven Dead Sea Mud Pac, deep-cleansing mask, focus on T-Zone. The skin on your cheeks can differ to the T-Zone area, meaning you may need a hydrating mud mask to add moisture back into dryer skin. We recommend our hydrating mud trio of 7th Heaven Strawberry Souffle, 7th Heaven Very Berry and 7th Heaven Creamy Coconut. Optionally you can also apply these masks to your neck and chest to hydrate these delicate, forgotten about areas. If dull/tired looking skin is your main worry, opt for a purifying peel-off such as, 7th Heaven Black Seaweed Peel Off. 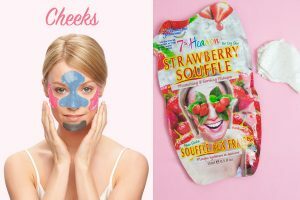 7th Heaven Strawberry Souffle hydrating mud mask (available at Claire’s.) Focusing on dryer areas of face. 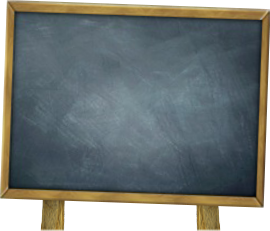 Hormonal break-outs are notorious for making an appearance around the chin. Banish those frustrating break outs with the antibacterial properties of our 7th Heaven Clean Up Mud, a deep-cleansing mud mask packed with Aloe Vera, Witch Hazel and Evening Primrose. To open pores and draw out impurities within this usually congested area, our self-heating 7th Heaven Hot Spring Sauna Masque is ideal. 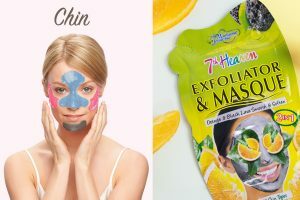 NEW 7th Heaven Exfoliator & Masque 2 in 1 (available now in Ulta). Focus on chin for a deep, exfoliating cleanse. Go all out on your beauty ritual and treat cuticles, hands and feet with our NEW Spa Range. This paraben-free range consists of 7th Heaven Soften Glove Masques, 7th Heaven Nail & Cuticle Finger Masques and 7th Heaven Soften Sock Masques, featured recently in British reality TV hit, Only Way Is Essex. Apply during your face mask session for perfectly moisturized hands and feet ready for a fresh mani/pedi! 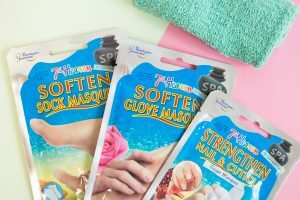 NEW 7th Heaven Spa Range featuring 7th Heaven Soften Sock Masques, Soften Glove Masques & Strengthen Nail & Cuticle Masques. Full Spa Range available soon at select Walmart locations. Tailor your skincare with 7th Heaven! 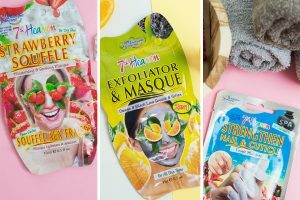 Find the face masks for you with our simple three step quiz here. Want to try the multimasking trend? Snap a selfie and use #My7thHeaven and let us know the masks you’ve chosen! 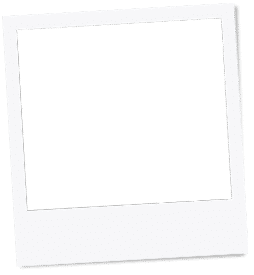 Have the chance to feature in our Show Us Yours gallery.